Designed by Magic Makers, Inc. & printed by US Playing Co. 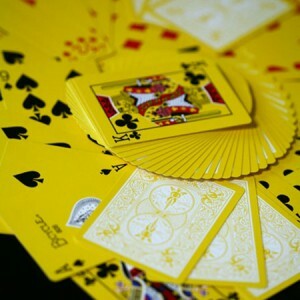 This poker deck screams yellow across your spectator’s eyes with full color court cards sporting black and red pips! Beyond the 52 standard cards, this deck holds 4 extra magic cards giving you the ability to do the Million Dollar Monte, Si Stebbins Effect, Joker Trick, and blank yellow deck to all different card faces.